Mount Royal University’s theatre students have been playing hard and working harder to bring about a series of upcoming plays. Whether a twist on a Shakespearean classic, an involved character study of over 60 characters spanning six decades or a playful treatment of a traditional Chinese opera, theatre students have produced something for everyone this semester. Most have read, or at least heard of, Shakespeare’s Hamlet. Everyone knows, “To be or not to be,” but that’s where it ends for some. For those who haven’t read Shakespeare’s tragedy, it is probably best to know before reading on that there are two bit characters named Rosencrantz and Guildenstern. 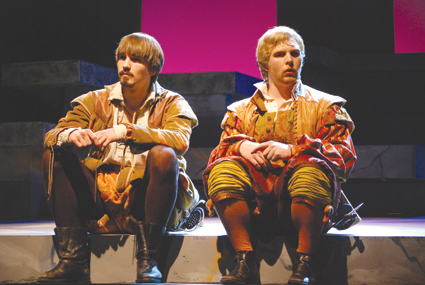 In 1966, Tom Stoppard took those two and gave them a life of their own in writing Rosencrantz and Guildenstern are Dead, which is going to be performed at Mount Royal University’s Wright Theatre. This piece of metatheatre, or a play within a play, follows the pair around as they try to make sense of their existence, as well as what is going on within the world created in Hamlet. Second-year performing students, under the direction of Glenda Stirling, will star in this main production at MRU for the fall semester. Having adorned the walls of their rehearsal space in rolls of paper covered with analysis, Stirling and students follow a busy rehearsal schedule requiring a lot of work, both on and off stage. It isn’t without its rewards though, said the play’s director. “I’d say the most fun is working with the students (who are) working on such a giant piece and watching them step up to the plate,” Stirling said. “There are so many elements underneath. With MRU’s performance program being only two years long that time is coming to an end in June. It would not be surprising to see some of these actors getting work in a professional setting. The production will be showing in the Wright Theatre from Nov. 17 to 26, giving students and general spectators multiple chances to catch the show. A typical play has a set number of characters the story revolves around and sees them progress throughout the show to tell a story. Mount Royal’s production of A. R. Gurney’s Scenes From American Life throws that conventional structure out the window. The show, which is being directed by Jane MacFarlane, is a compilation of moments in and around Buffalo, N.Y. between the 1920s and ‘80s. The characters’ names are rarely given to the audience, and it initially seems as if there are over 60 different characters being portrayed by the 22 first-year student-actors. However, a closer look reveals many of these characters have repeat appearances, having grown over the years and built relations with each other. With each student playing at least three roles or similar characters at different times, the real challenge is finding the balance between making the scene stand alone and making them all blend. Even though this production is being performed at MRU’s Nickle Theatre on Nov. 25, it is only open to family and friends, so be sure to buddy up with someone in the performance program. This is one play that will challenge you to think, and should not be missed. It won’t just be the Mount Royal community enjoying the upcoming theatre productions. Starting in mid-November, MRU Theatre will be taking its show on the road, bringing Amazing Adventures of the Monkey King to elementary schools around Calgary. Written by Elizabeth Wong and directed by Carol Curties, Monkey King is an incorporation of as many elements as possible from the traditional Chinese opera. It is a story so well known in Chinese culture that performers begin training for the show at age seven with an expectation of performing in the show as a lifetime gig. First told as the true story of a monk travelling from China to India during the Tang dynasty, it has expanded over time to include over 100 different stories. However, the cast of five is choosing to focus on that first story. For show performer Jesse Ajohn one of best parts of the tour will be the audience they are performing for. “Getting kids interested about this story is what I would like to achieve,” Ajohn said. “The best part of the tour is the question-and-answer period after the show. Even though the show is not being performed for a typical audience, there is still the same effort and determination to put on the best show possible, with physical challenges and dance choreography being one of the focuses of rehearsal while progressing forward. Rosencrantz and Guildenstern are Dead is open to the public and admission is $15 for adults, $10 student/senior/alumni, and 2 for 1 on Nov. 22, 23, 24.